Allen and Lindstrom dove in. They bought a fleet of inflatable paddleboards and opened up rentals to the entire country through their website SUPrents.com. “It would have been smart to limit it to Washington and Oregon where we live, but we assumed all of our business would be in Hawaii,” Allen said. Since day one, SUPrents has offered free shipping. “It doesn’t matter where the paddleboard is going. It’s free shipping both ways,” Allen said. The team often gets emails asking if what they’re offering is too good to be true. “I think some people are taking a leap of faith with us,” Allen said. “They’re wondering how the shipping system actually works.” After setting up the rental online, the board is shipped straight to the client, then once the rental is over, the client puts the paddleboard back in the box it arrived in and slaps a pre-paid label on it. SUPrents sets up the pickup. The paddleboards for rent range from 10 feet to the Megalodon—a 50-pound, 15-foot-long inflatable paddleboard that carries up to seven adults. The startup also plans to offer kayaks the same way in the near future. 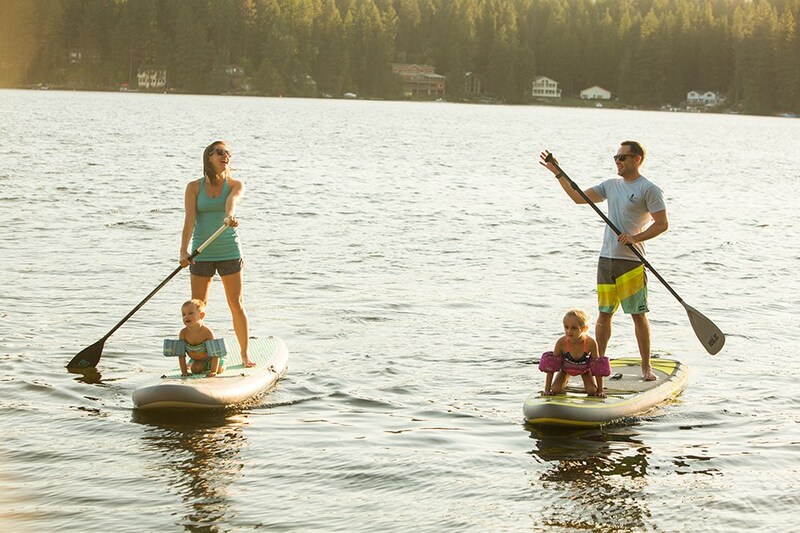 “Some people are hesitant to try standup paddleboarding, but their kids want to, so to be able to rent everything in one place, that’s the ultimate goal,” Allen said. Last spring, a public school in Chicago rented thirty-five boards for P.E. class. The opportunity to rent in bulk is something the pair hopes to explore more. Allen and Lindstrom understand not everyone has thousands of dollars to purchase a paddleboard. “You don’t need to spend that kind of money on something that you’re going to use once a summer,” Allen said. SUPrents paddleboards can be rented for as few as two days in California and the Pacific Northwest, and up to two weeks across the country. Renting one 10- to 12-foot board for two weeks costs between $229 and $289 and the boards can be paired with automatic pumps and life jackets. “We felt like we were being gouged when we were renting and we didn’t want to do that to other people,” Allen said.